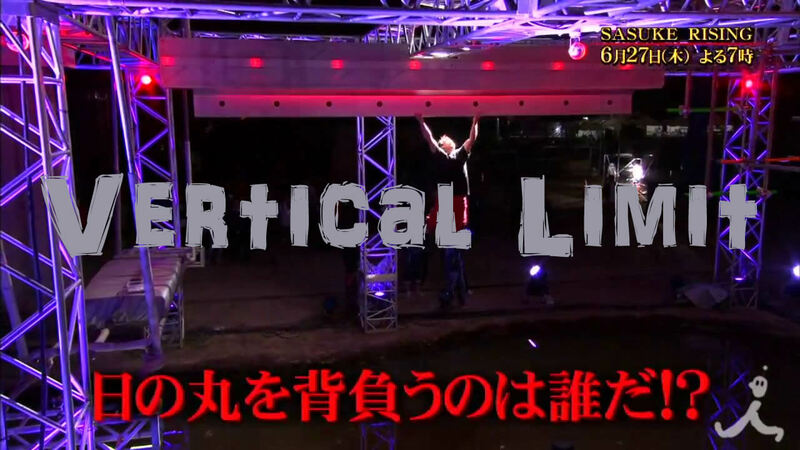 When it was introduced in Sasuke Rising (Sasuke 28), after Yuuji Urushihara's total victory in Sasuke 27, the vertical limit stunned the crowd. It looked as though someone had taken the Ultimate Cliffhanger, an already nearly impossible obstacle (perhaps the toughest obstacle of all), and made it even tougher. Instead of having three centimeters to grab onto, you only have one centimeter. To put that in perspective, a centimeter is about half the length of your fingernail. Imagine having to go across a 14 foot ledge with just half your fingernail able to fit on the ledge. The image shown in the building section is a closeup of the vertical limit. The lip that sticks out the bottom is what competitors have to hold onto. For those who have not seen either Sasuke Rising and/or Sasuke 28, and would not like it to be spoiled, do not click below. The vertical limit was only attempted by one competitor, in Sasuke 29, and was conquered. Even so, it still may be considered the most difficult obstacle. The vertical limit can most easily be compared to the Ultimate Cliffhanger and Crazy Cliffhanger (the Sasuke Rising and 29 version of the cliffhanger). Although the Vertical Limit is one third the tickness, the Ultimate and Crazy Cliffhanger do have gaps. The vertical limit is surprisingly quite easy to build, considering it has no gaps and is just one long ledge. The easiest way to build the Vertical limit is to find two trees and nail a board across both of them (using support beams if necessary) and nail the 1cm ledge onto the board. You can get both the one centimeter ledge and a long board at most large hardware stores including Lowe's and Home Depot. If you are unable to find a one centimeter ledge, most stores will cut one for you. You can also go slightly thinner or thicker for convenience. Another important tip is to make sure that your ledge is not too sharp along the edges. What helped me to dull the edges of my Ultimate Cliffhanger (which is still in progress), was hitting the edge lightly with a hammer. Traversing the Vertical Limit is very similar to traversing the different cliffhangers in regards to the strain on your fingers and the muscles required. In fact, the only thing different is the grip. On the vertical limit your palms facing towards you, unlike the cliffhanger where your hands are facing the opposite direction. Furthermore, your four fingers are holding onto the lip of the ledge while your thumb is pinching the vertical limit on the other side to help reduce the stress on your fingers and maintain a solid grip. The best way to think of this is that you are in a chin-up position on the vertical limit, versus a pull-up position on the Ultimate Cliffhanger. You do move slower in a chin-up position rather than a pull-up position, but it's still possible to move quickly through the vertical limit. That covers the grip for the vertical limit. As far as the best way to get across, you want your arms bent at a 90 degree angle. You should also put an emphasis on getting through as quickly as possible, which means you want a lot of forward momentum carrying you through. Special thanks to Evan Roehl for his contribution to this page.